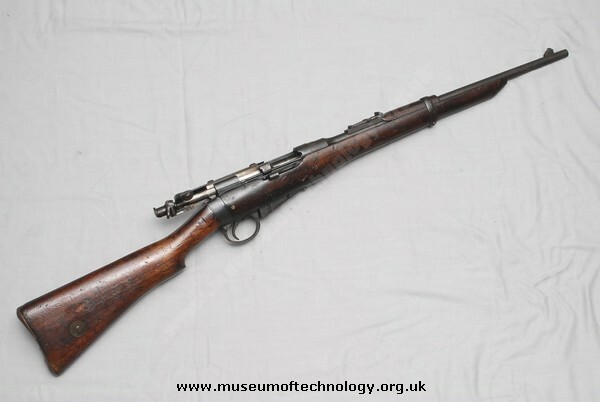 The Lee Enfield Mk1 with Enfield rifling, followed the Lee Metford range of rifles with Metford rifling. I agree completely with Simon Young's comment. This is quite obviously an inexpert "sporterization" of a service rifle rather than a conversion of a service rifle into a service carbine. Note the crude surgery done to the lower portion of the fore-stock and, most of all, the fact that a portion of the breach had been cut away. The Ordnance Board would never have sanctioned such a modification. This may be a Lee Enfield cavalry carbine made specifically for the NZ Mounted infantry in the Boer war about 1899.It certainly looks very similar.Some of the specific cavalry accoutrements may be missing.It was kept in a special leather boot at the rear of the saddle and the barrel tied with a leather thong, though in practice the soldiers rode with 1 hand and held the barrel with the other when expecting combat.They did not fight from horse back but dismounted and acted as light infantry. Most were skilled horsemen in civilian life.My great grandfather was one of them.He had previously been in the British army before coming to NZ. The original full length fore-stock has had its metal nose cap removed and the wood shortened in length. The top hand guard has been shortened too. This was a common modification done by civilian owners to surplus rifles sold to the public by the trade. The intent was to produced a lighter rifle used for hunting. However, removing part of the stock would change the shooting characteristics of the bedding of the rifle and poor acuracey and wandering zero would result.